Have you heard about this movie? If you have, you must keep up with horror and movie blogs. If you have not, you are missing out on a very interesting film. The hunter and the film makers. 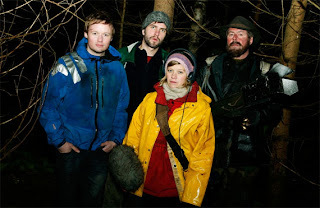 Trollhunter is about a group of student film makers that are investigating poached bears. A few leads point them to a man named Hans. They think he is the poacher. They find out he is a hunter, not of bears. A lot of comparisons are made of this film and Blair Witch Project. The biggest similarity is the hand held, found footage setting of the film. But unlike the motion sickness and claustrophobic style of Blair Witch. 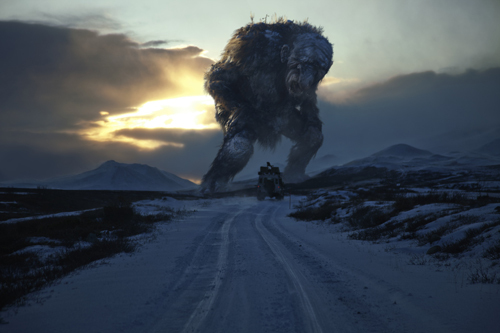 Trollhunter takes in the scenery. The characters are more professional in their filming style. If you watch this film you won't need motion sickness medicine. It is labeled horror film. After watching it, I felt as if I had watched a fantasy wildlife documentary. The reason is because Hans is not hunting the trolls because he is looking for glory. He is hunting the trolls because it is his job. A dirty, smelly, ungrateful job. 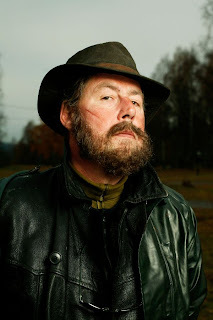 Hans, the troll hunting civil servant. 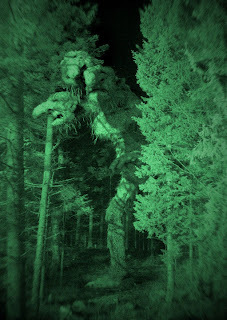 As you follow the students and Hans on his nightly hunts, you find out about the trolls. The movie treats them as large (in the case of one, large hill sized) mammals. Hans hunts them, but he also respects them too. In one scene, he retells a story that shows a dark chapter in his life. He agreed to let the students film him because he wants his job to end and the public to know the truth. Why doesn't the public know? Because the government is keeping trolls a secret. No reasons are given to why. You can assume public safety, or protecting an endangered species, but you never know the real reason. Han's boss, Finn, is a bureaucrat. Not evil, but willing to do anything to make sure the public never finds out about the trolls. Is it a horror film? There are some scary parts. A few horrible deaths, mainly goats. You can watch this film with the lights off, you will not have to worry about nightmares. The middle head is the only real one, the others grow in later. There are a few funny bits. My favorite was the Polish "painting" service that is hired to help cover up the truth about the trolls. They are the only people that speak English in the film. The short scene they are in is one of the funniest. Especially if you have ever been in a situation where you had to rely on incompetent people to help you with a job. I do recommend this movie. If you are a fan of fantasy, or large monsters, or just want to see some amazing shots of the scenery in Norway, buy this movie. It is well worth it. The climax of the movie and also it's poster .